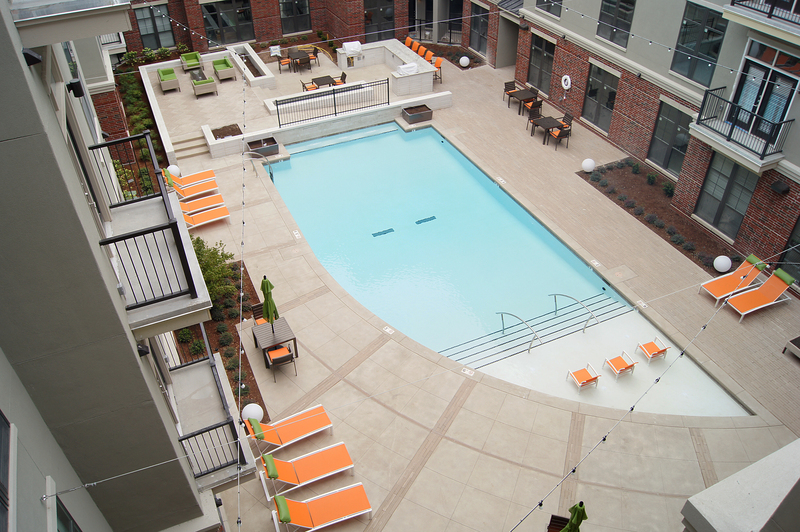 Downtown Tulsa’s newest luxury apartments are within walking distance of the historic Brady Arts District, the Blue Dome District and Tulsa Performing Arts Center and offers amenities for an active lifestyle. This high end residential apartment offers everything one would need to live life to the fullest. Residents can enjoy a workout in the 24/7 state-of-the-art exercise facility, relax in the large swimming pool with a tanning ledge, plan social get-togethers or family outings in the outdoor kitchen and BBQ grill area. The Bomanite Exposed Aggregate Alloy System is a perfect match for the luxury living at The Edge at East Village Apartments. 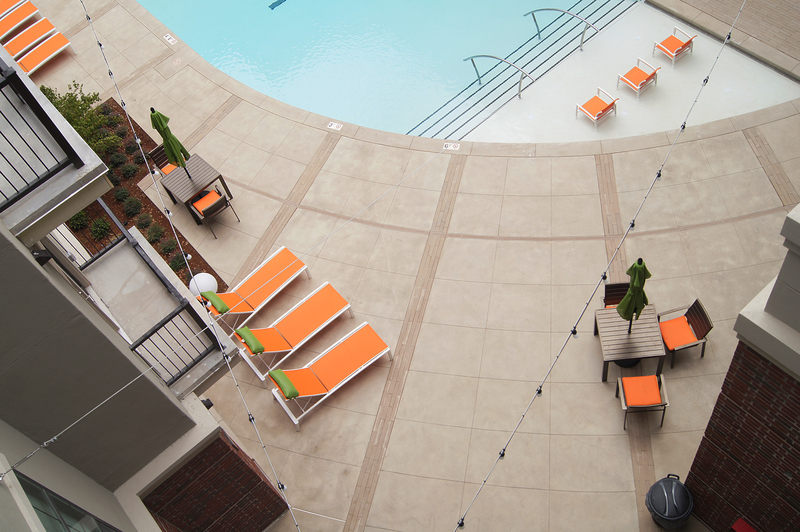 Bomanite Licensee, Bomanite of Tulsa worked with the designers at Alaback Design Associates and after reviewing samples, they chose Bomanite Alloy for its highly architectural reflective properties and surface slip-resistance qualities for the apartment pool deck. The pool coping was placed using Bomanite Alloy as well. Radius saw cuts were incorporated into the design to continue the detail of the pool. Bomanite Alloy is a unique alternative to other decorative concrete finishes. 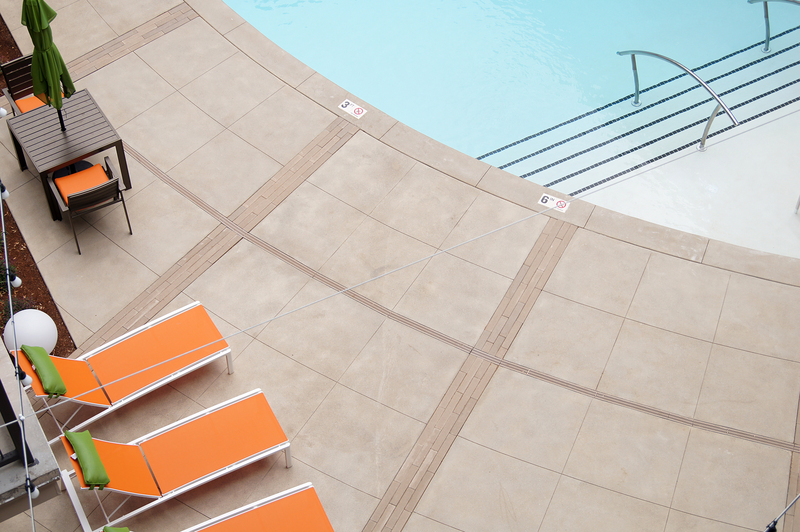 Its low life cycle cost is a bonus for multi-unit complex developers, providing improved wear resistance for light- to moderate-duty vehicular or foot traffic, assisting in low maintenance for the heavily used patio and pool deck areas of the The Edge Apartments. Due to the use of Bomanite Sand Color Hardener, these highly durable surfaces are available in a wide range of aggregates and permanent light fast colors to help reduce heat island effect. Bomanite Alloy is highly sustainable as well as a suitable choice for architectural luxury designs.